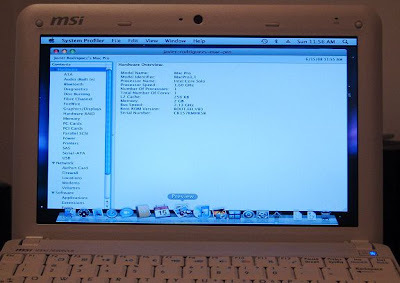 An Insanely Mac Forum member by the name of JAV got his hands on an MSI Wind, and one of the first things he did was install a hacked version of OS X 10.5.2 on it. And for the most part, it worked right away. The WiFi card isn’t working yet, but Ethernet and Bluetooth work out of the box. Installing OS X on non-Mac hardware is a violation of Apple’s licensing terms. But it’s interesting to see that it’s easier to install the Mac operating system on unsupported hardware than it is to install the open source Ubuntu Linux distribution. At least for now. As CrunchGear and other sites have pointed out, Ubuntu 8.04 Hardy Heron hangs when you try installing it on an MSI Wind notebook. I suspect this is a temporary issue, as Canonical is currently working on Ubuntu Netbook Remix, a custom version of Ubuntu optimized for devices with small screens and Intel Atom CPUs. While MSI will eventually offer a Linux version of the Wind notebook, it will be running SUSE, not Ubuntu. But I suspect the Ubuntu/netbook hacking community will figure out a way to get Ubuntu up and running soon after the laptop is released. Update: Paul at MoDaCo has posted step by step instructions for installing OS X on an MSI Wind, Medion Akoya Mini or Advent 4211. Maybe… but I still prefer Ubuntu. With the release of Ubuntu Hardy Heron 8.04.1 (july 3rd), it appears that earlier problems installing Ubuntu on the Wind have been resolved. If they won´t do cheap hardware now that all is Intel pc stufff inside anyway, then whatever to EULA. You can get a MacBook Pro clone for less then half of a real MacBook Pro, and you get the same performance. Steve parks on handicapslot, he can say wahtever he want to this. Any OS should run on any hardware. I do love Apple apps and macs, but they are nothing more then pc´s in a different box and running EFI. MSI Wind and Ubuntu (XUbuntu, to be exact) 8.04.1 get perfectly together for me. I have a Wind thats runnung Xubuntu without any problem. And the installation was just like on any other PC. I’m glad to have that OS on my umpc, now I’m just waiting for a 6-cell battery. 🙂 it was a temporary issue. I installed Ubuntu Intrepid Ibex using a LiveUSB without a problem. in running osx on my msi wind and love it works like a champ..